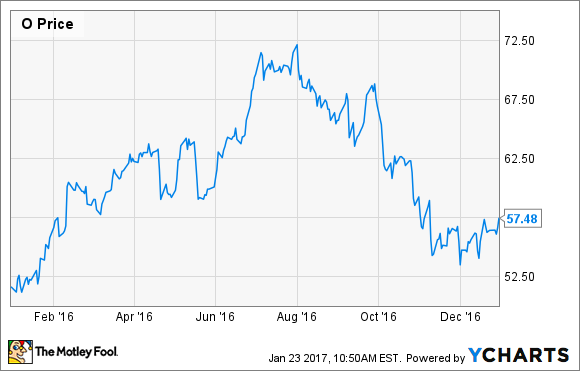 Will 2017 Be Realty Income Corporation's Worst Year Yet? Realty Income plunged 20% in the last five months of 2016. Will the downtrend continue? Leading net-lease retail real estate investment trust Realty Income Corporation (NYSE:O) performed extremely well in 2016 -- until August. For the last five months of the year, the stock plunged by 20%. To put this into perspective, if this rate of decline were to continue throughout 2017, the stock would lose nearly half of its value in 2017, making it the worst year in the company's NYSE-listed history. Could that happen? As I mentioned, Realty Income delivered terrible performance during the latter half of 2016. As you can see in the chart below, the stock was actually having a great year until August, when it reversed course and continued to decline for most of the rest of the year. The main reason for the decline is simple -- interest rates. More specifically, toward the latter half of 2016, the economic data was indicating that the period of record-low interest rates was coming to an end. Unemployment hit a record low in late 2016, and GDP growth and inflation data pointed toward a Federal Reserve rate hike and the expectation of a rising-rate environment for the next few years. Rising interest rates are bad for REITs in general, as income investors demand a higher yield from "riskier" assets when risk-free income investments like Treasury bonds pay more. As a simplified example, when the 10-year Treasury pays 2%, a 4% dividend yield from Realty Income might be worth the added risk. When the Treasury is paying 5%, not so much. In Realty Income's case, a big downside to rising rates and the lower stock prices that come along with them is the increased cost of capital. While it does use some debt to finance acquisitions, Realty Income's preferred method of raising capital is by issuing equity, aka stock. When Realty Income's share price is increasing, like it was for the first half of 2016, it means that the company doesn't need to issue as much new equity to finance acquisitions. In fact, Realty Income ended up acquiring twice the volume of properties it had originally planned to in 2016, simply because its cost of capital is so low. As the share price falls, the company doesn't get as much value for its newly issued shares. Despite the decline in share price over the past six months or so, it's important for investors to know that business-wise, Realty Income is doing just fine. For one thing, the company added about $1.5 billion in new properties to its portfolio in 2016, much of which at record-low costs of capital. As I mentioned in the last section, since Realty Income's share price has cooled off, the cost-of-capital isn't as favorable. So, I expect acquisition volume to drop somewhat in 2017, but the moves in 2016 should add significant value for shareholders. In addition, there are several other signs of health investors should keep in mind. Realty Income still has investment-grade (Baa1/BBB+) credit ratings, an occupancy rate above 98%, and the company was able to increase its dividend by 6% year-over-year for 2017. The point is that while Realty Income's stock price can fluctuate quite a lot over short periods of time, investors should feel confident from a long-term perspective. Will 2017 be Realty Income's worst year ever? To be perfectly clear, I don't think that there's much of a chance that Realty Income's stock price plunges by half in 2017, or anything close to that. At this point, the economy is doing well and the Federal Reserve has provided a clear, detailed forecast for interest rates, so I believe most of the potentially negative effects of higher interest rates are priced into the stock. As rates rise, as long as there are no huge surprises from the Federal Reserve, I see Realty Income's stock being range-bound for the time being. In other words, I don't think 2017 will be the company's worst year, but it won't be a particularly good one either.